The Pharmacy 777 George Bass Surf Boat and Dial Before You Dig Ski Marathon is drawing to a close with the penultimate leg completed today. 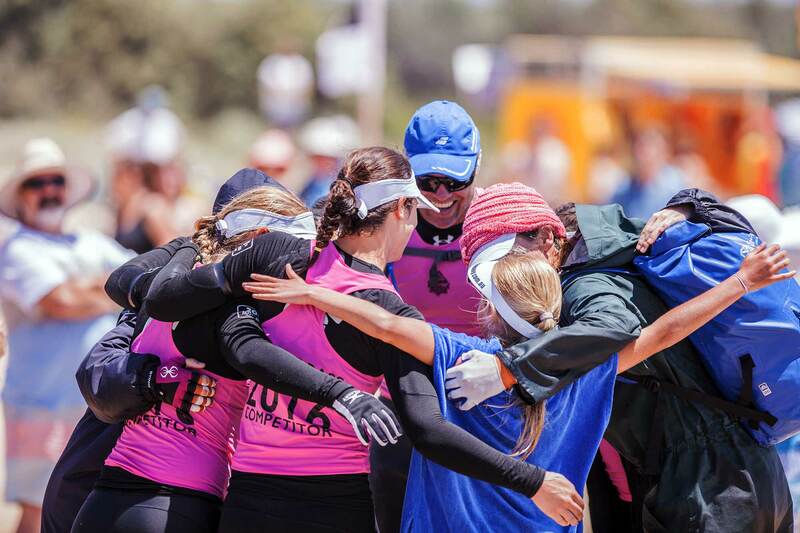 Pambula Masters women were the first crew to arrive at their home beach completing the 27km leg from Tathra. Bulli again took out the Open Men, while North Cronulla took out the Open Women. Wanda took out the Masters Men, fending off fierce competition from Narooma and North Cronulla. There was some great racing with Mollymook, competing in their first bass, neck and neck with Long Reef and Coogee in the Men. In the Open Women’s Moruya took home second place for the second day in a row with a strong performance. Broulee finished in third while the Broulee Canberra Capitals came through in 4th. In the ski race Paul Buttle took out the Open race, while Nick Ziviani and Joe Hasley took out the Double ski. All competitors were delighted to hear from Pambula sweep Wanye Kent at today’s presentation and see he is doing well. Marathon organiser Andrew Edmunds said all rowers and paddlers were looking forward to the thrilling finish at Eden tomorrow. “While the first place getters in each category are sorted we still might see some movement in for second and third depending on the results,” he said. 2nd Brendan Cowlend and Tony Ireland. Day four of the Pharmacy 777 and Dial Before You Dig Ski Marathon has proved to be the toughest day yet on the water. Competitors in the marathon faced two metre swells as they rowed in to a 26km per hour southerly wind for the 24 kilometre leg from Narooma to Bermagui. Three competitors of the Broulee Bats Masters Women side were treated for mild hypothermia, while a Avalon Beach rower sustained a knee injury. Broulee Bats Sweep Justin Zutt said losing a few rowers made for an extremely difficult day in the office. “We still had around 12 kilometres in the course to go, it was hard enough going with eight rowers but dropping back to six for the back half of the race made it really tough. Bulli Open Men have just about locked away the overall win with another strong performance today finishing the race in under 3 hours. Paul Buttle won the Open Ski, while Nick Ziviani and Joe Hasley won the Double ski race. Jacqui Keough spent the longest time on the water for the ski competitors paddling for over four hours. Meanwhile paddler Simon Steinhouse has unfortunately had to withdraw from the race due to illness. In the Masters women Pambula again have remained undefeated as have North Cronulla in the Open Womens. Marathon organiser Andrew Edmunds said those leading crews are in a almost unbeatable position in the overall pointscore. “They’d pretty much have to come last every leg from here on out which shows how strong they have been,” he said. “In the Masters Men category however that race is still wide open, as are the remaining podium places in the other categories. Mr Edmunds praised the entire fleet for today’s effort. “It was cold, wet and windy in a very tough and grueling day on the ocean with a number of competitors and crews on the water for more than four hours. Tomorrow’s leg is the longest for the week, a 36 kilometre slog from Bermagui to Tathra. Bulli and North Cronulla were yesterday leading the George Bass Surf Boat Marathon, both crews dominting through the first three legs. The third leg of the race began at Coila Beach, with 13 surf skis and 25 surf boats on the water. The course took the crews around Potato Point and Dalmeny before pulling into the beach near Narooma Surf Club, a 22 kilometre trek. The crews were greeted by fantastic rowing conditions, with the only negative a slight south-easterly wind. That didn’t stop the boats from flying down the coast, however, as the winning time of one hour, 46 minutes, and 45 seconds was more than 15 minutes faster than day two’s 18-kilometre leg. Narooma’s Masters Men’s sweep Brendan Constable said day three’s leg was important to his crew. “Hopefully it gives those boys a little extra to come home as quick as we can,” he said. Bulli’s Open Men’s crew won on all three days, and had a solid lead in the competition heading into day four. Crew member Adam Barlow admitted day three’s leg was the toughest so far. “We figured this would be the day that everyone would come out and have a crack at us. North Cronulla’s Open Women’s crew copied the feats of Bulli, taking home their third successive leg win in a time of 1:53:09. North Cronulla also entered a Men’s Masters crew in the competition, and spokesperson Steve Swane says the mix helped their preparation. “We’ve got a good group of blokes and girls who have been training well together,” he said. “Our men finished fourth today which was a bit of a bummer, but it was one of those off days. Pambula’s crews have faced a unique challenge this year, with their sweep Wayne ‘Superman’ Kent suffering a heart attack after day one. Crew member Andrew Holt said his crew were fighting hard in spite of the setback. “Super had trained up one of the new rowers to be a stroke, and I told him he’d be really proud of the way he rowed today,” he said. “We’ve kept his thongs in the boat, and we’re not going to take them out. Barlow believes the key to the rest of the competition is tactics. “There’s a temptation to keep your best four going and really thrash them, but you can fall apart at the back end,” he said. Swane echoed these sentiments, and said recovery was also key. “Whoever can recover the best will do the best tomorrow,” he said. 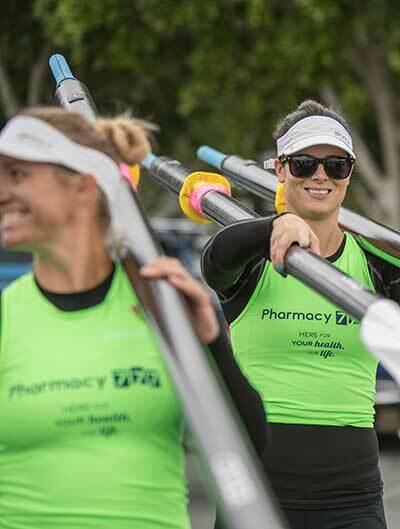 Bulli have gone a step closer to claiming their fourth straight overall win of the Pharmacy 777 George Bass Surf Boat Marathon with a dominant performance on day two. The Bulli Open Men crew overtook the entire fleet, while North Cronulla enjoyed their second straight victory in the Open Women. Pambula, who are the defending champions in the Masters Women also took out their second straight victory, while North Cronulla also took out the Masters Men. It was a challenging day, especially for interstate visitors from Darwin who were greeted with a strong southerly wind and 1.5 metre swell which tested the rowers and ski paddlers on the 24 kilometre leg from Moruya Heads to Tuross. The day started with a memorial for the late Lesley Pheeney and then the crews set off on the leg. Female Ski paddler Jacqui Keough unfortunately had to withdraw from the race with a broken rudder. The Ski paddlers in the Dial Before You Dig Ski Marathon were the first to make it to the finish line. Double ski competitors from Narooma Joe Hasley and Nic Ziviani were the first to cross the line. Paul Buttel took out the Open Ski for today’s leg. The end of the race was a stark contrast to the drama of yesterday. Marathon organiser Andrew Edmunds said crews were relieved to hear the 66 year old male sweep condition is improving in hospital following his suspected heart attack on the finish beach. “He is currently awaiting surgery and we hope he’ll be out of hospital in a few days,” he said. “The situation highlighted how everyone participating in this event are surf life savers first and competitors second, with the Pambula crew, Grange competitor, Mollymook competitor and our surf life savers on duty all clicking into action as soon as the emergency situation arose. Day one of the Pharmacy 777 George Bass and Dial Before You Dig Ski Marathon has got underway. Crews departed Batemans Bay just after 9am this morning and battled the first leg of the seven day 190 kilometre race from Batemans to Eden. Today’s leg was 31 kilometres with boats and skis arriving at Moruya Beach between 12pm and 1pm. Conditions at sea were fantastic for racing. Unfortunately the day ended in drama with the sweep of a crew suffering a suspected cardiac arrest at the completion of the race. The sweep, aged 66 was provided with first aid treatment by the event safety crew and members of the public and received further treatment from NSW Ambulance before being transported to hospital in a serious condition. Marathon organiser Andrew Edmunds praised the safety team and participants involved. “They responded very professionally and we certainly hope the member has a speedy recovery,” he said. The Bass has attracted crews from all over Australia with competitors from Darwin, Noosa, Torquay and Grange in South Australia lining up against some of the strongest crews on the Far South Coast and NSW. Mollymook from the South Coast entered their first ever marathon. In the Masters Women Pambula kicked off their title defence well taking out today’s leg, as did three time reigning champions in the open Men Bulli. North Cronulla dominated the Open Women in the opening leg, while Wanda took out the Masters Men and John Patinson took out the ski race. RESULTS DAY 1 Batemans Bay to Moruya 31km. 2nd Brendan Cowled and Tony Island. 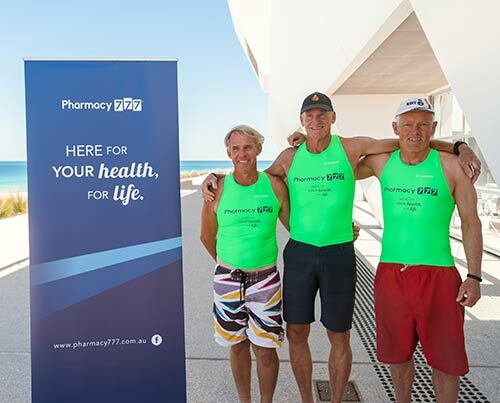 The George Bass Surf Boat Marathon committee are pleased to announce a brand new naming rights sponsorship for the George Bass Marathon, West Australian based pharmacy group - Pharmacy 777. The George Bass Marathon is held biennially from Batemans Bay to Eden, a 190 kilometre race made up of seven legs over seven days. Pharmacy 777’s vision is to enhance the quality of life within the community, with a team of pharmacists offering a professional and caring approach to complete healthcare. Their focus is to ensure patient and health care needs are met in collaboration with the wider health care network and local community organisations. Pharmacy 777 Managing Director Kim Brotherson said partnering with Surf Life Saving and the George Bass Marathon made perfect sense. “Surf Life Saving is all about saving lives and creating healthy Australians by encouraging physical activity and participation in sport,” he said. “The George Bass Marathon is the pinnacle of fitness and endurance for Surf Boat Rowing and has a proud history of attracting the very best competitors from all over Australia. Mr Brotherson said while Pharmacy 777 is currently located in Western and South Australia, the company were looking to expand to the East Coast of Australia in coming months. “We’re excited to have launched our national Pharmacy 777 Independent Community Pharmacy Network model dedicated to serving the community. We are ready and interested in talking to Pharmacists who share a similar vision, have spirit for innovation and live with passion for making a difference in our patient’s life,” says Mr Brotherson. Being part of the Pharmacy 777 Community requires strong leadership, shared values and dedication to service. Building and empowering a team of quality people, who share our values and resonate with our vision, is the optimal foundation for our future. Marathon organiser Andrew Edmunds welcomed Pharmacy 777 announcement and looked forward to their involvement. “Without the support of sponsors, volunteers, community and local councils the event would cease to exist, so we thank them for all their ongoing contributions and support. “The Pharmacy 777 George Bass Marathon is the world’s longest and toughest endurance surf boat and ski race,” he said. The George Bass Surf Boat Marathon committee are pleased to announce long-time supporter Dial Before You Dig NSW/ACT are back on board as major sponsors of the 2018 George Bass Surf Boat Marathon and naming rights sponsor for the Dial Before You Dig NSW/ACT George Bass Ski Marathon. Dial Before You Dig NSW/ACT State Manager Dominic Puiu said he was pleased to announce their support of the iconic race. “The marathon is the world’s longest and toughest surf boat and ski marathon and is unlike any other endurance race,” he said. “DBYD NSW/ACT has partnered with surf life saving over many years and are proud to be continuing our involvement. Marathon organiser Andrew Edmunds welcomed DBYD NSW/ACT’s announcement of their ongoing involvement. “They’ve been like family for the Bass for many years, especially the Dial Before You Dig Ski Marathon,” he said. Mr Edmunds said planning was well underway to make the surfboat and ski marathon, in its 20th race, one of the biggest ever with crews from NSW, ACT, QLD VIC and possibly SA and the NT expecting to take part. A naming right sponsor for the George Bass Surf Boat Marathon is expected to be announced in September.